One of the early London teachers of midwives, Scotsman John Maubray died in 1732, eight years after his book The Female Physician was published. Maubray and a group of other London man-midwives followed the ideas of a surgeon from the Netherlands, Hendrik van Deventer (1651-1724). Deventer's wife was a midwife, and he promoted methods to adjust the presentation of the fetus or increase the size of the birth canal, rather than use forceps in difficult deliveries. 1. According to Maubray, who were the best birth assistants? 2. 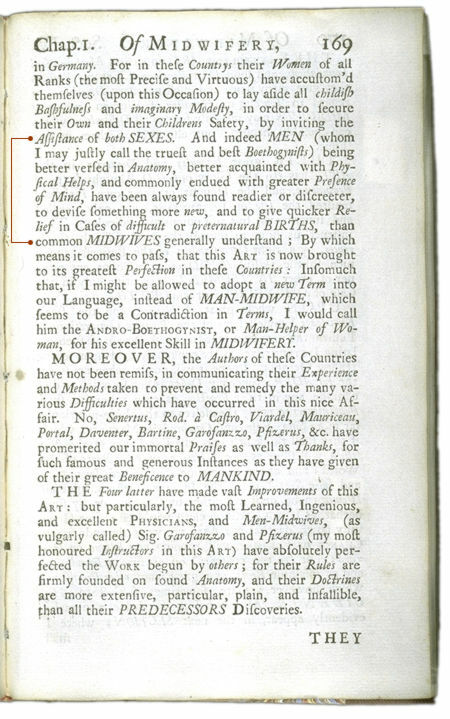 What knowledge, according to Maubray, led to the perfection of the art of birth assistance? 1. What practice associated with man-midwives did Maubray discourage? 2. How did Maubray characterize ordinary midwives, versus extraordinary ones?